Man, I forgot how depressing Watchmen was. The original series is a comics classic, often considered a touch point in the history of comics that heavily influenced the ton of everything that has come after in. Gone were the shiny bright colors and the BOOM BLAM SPLAT of the early generation’s comic and in was the dark, cynical worlds heavily influenced by Alan Moore. I was one of those people who thought doing prequel series was a stupid idea, one that would get handily rejected by comic buyers everywhere. And yet they didn’t. Eight different prequel series were completed and fairly well-received by critics. So here now it’s my turn to experience these prequels. For the next few Mondays, I’ll be reviewing the up-coming trades of the Watchmen prequels as a sort of Comic Con warm up. Click here for my review of Minutemen / Silk Spectre here. I received an e-ARC from the publisher in return for an honest review. Discover what happened before WATCHMEN. The team of legendary writer Len Wein and acclaimed artist Jae Lee--in his first DC Comics' work in nearly a decade--delve into the mind of the smartest man in the world: Ozymandias. How does one go from the son of immigrant parents to becoming the world's smartest man? Adrian Veidt begins his journey, both spiritual and physical, that will one day make him one of the most pivotal players in the world-changing events of WATCHMEN. 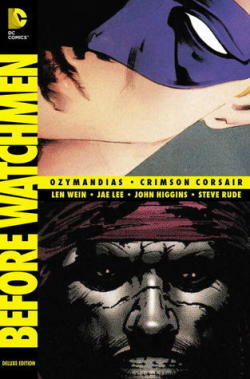 Collects: BEFORE WATCHMEN: OZYMANDIAS #1-4, BEFORE WATCHMEN: DOLLAR BILL #1 and the CRIMSON CORSAIR backup stories. Of all the volumes, this was the one I was looking forward to least. Ozymandias is a shadowy pompous figure in Watchmen that really needs a kick to the face while the Crimson Corsair was a prequel to the strange side story that took place in bits and pieces throughout the issues of the Watchmen series. Both were prequel series based on my least favorite bits of the original series and I wasn’t wrong in assuming that these particular prequel tales wouldn’t sit well with me. It all just made me want to hit my head against the wall. Though I must admit that it was nice to get at least a little more insight in the events that took place in the background of Watchmen. Even with his pompous nature, there were pieces of realty between the narration though it was mostly tell instead of show storytelling, which is particularly weird considering it’s a comic book. Rather than tell the story in “real time” events and dialogue, it was primarily told from the perspective of looking back on events long since passed. The series of the Crimson Corsair is a lead into the non-sequitur side story, Tales of the Black Freighter, being read by a bystander that has no real effect on the main story. It’s told in two or three pages at a time throughout the Watchmen series and it looks like Crimson Corsair was told in a similar manner as every two or three pages, there is a new intro page with a title. It’s the story of a man, who finds himself stranded at sea after his ship and entire crew are attacked. The Crimson Corsair and his ghost ship find him and set him on the task of finding three objects to regain his immortal soul. It’s all dark and depressing in the usual pirate tale fashion that also involves slavery, voodoo, zombies and an inevitable unhappy ending. It reads quickly and predictably though my e-ARC was missing several pages in the middle. It’s full of nightmare-inducing horrific images, but overall has no real attachment to any of the other stories within the Watchmen prequel series. It’s just another way to show the bleakness and impossibility of the world, how happy endings do not exist. This collection also included a one off about Dollar Bill, one of the original Minutemen, who was part masked crime fighter and part bank spokesperson. Though he personally has an unhappy ending – as most masked crime fighters do – this one issue had glimpses of hope and light where the rest of the volume was firmly planted in a dark cave of despair. Jae Lee’s art is probably most like the original series and makes Ozymandias story feel the most connected with the original series. The art was probably what kept me holding on after Ozy’s ego started having a real effect on my attitude towards the comic. Sticking often to a pallet of amber browns and sky blues, there was a distinct feeling of epicness and separateness between past and present. Most pages has a dominant color weaving through the panels, which allowed the panels to flow together easily without the eye being easily distracted by any one panel. John Higgins’ nightmare art for Crimson Corsair also called back to the Black Freighter strips, all shades of grey and black. It was all very pulp noir in nature and lends well to the graphic nature of the living dead story. So yeah, not my favorite of the prequels, though that was expected. If I never have to live inside the head of Adrian Veidt, it’ll be too soon. That dude needs to get punched in the face. I received an e-ARC from DC Comics in return for an honest review. All opinions are my own.